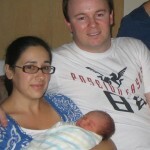 Claire and Al had a baby boy on Thursday 4 September at 12.50 pm at Pindara Private Hospital (Gold Coast). 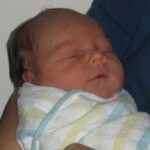 His weight is 8 pound and 8 ounces and he is 52.5 cm long. His name is Hugo Rankin Lattimore. 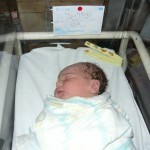 A new baby cousin for Ben, YAY!!! Well done Claire and Al!!!! He is a delightful little man! 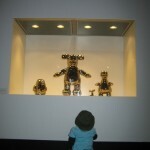 Author BelindaPosted on September 5, 2008 September 11, 2008 Categories FamilyTags Al, baby, Claire, cousin, Hugo, Lattimore2 Comments on A New Baby Cousin!!! 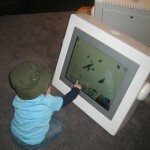 Author BelindaPosted on August 11, 2008 February 4, 2011 Categories Benjamin, FamilyTags Ben, talkingLeave a comment on What I can say. 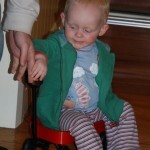 This morning Ben was playing after breakfast as normal when he began to become frustrated with his little wagon. He was trying to sit in it. 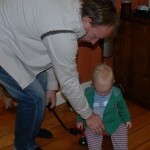 This was a difficult task as it is small and Ben is not walking yet. So with a little help he hopped in. Well no guesses what he wanted then. I think he thinks it’s like Ollie’s big wagon. But none the less it still worked and Ben was able to have his wagon rides up and down the hall (all the while saying ‘bruuuum, bruuuum). We may have to invest in a bigger wagon. By the way Ben is in his PJ’s with a hoodie. It’s a pretty tragic outfit otherwise! 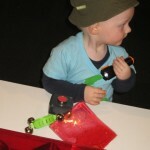 Author BelindaPosted on August 11, 2008 February 4, 2011 Categories Benjamin, FamilyTags Ben, hallway, little, Ollie, red, ride, small, wagon2 Comments on My little red Wagon! As I have already said Ben likes to call all animals ‘Woof, woof, woof, woof, woof’. 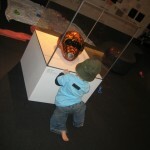 Recently he was on the change table playing with a toy horse while Andrew was changing his nappy. He was saying ‘woof, woof, woof, woof, woof’ while Andrew was explaining that it was a horse not a dog and horses go ‘neigh, neigh, neigh’. With this explanation Ben put his good arm in the air and said ‘Hooray! !’ to which Andrew replied ‘Yep I’ll take that, it’s pretty close’. Good Job Ben!!! 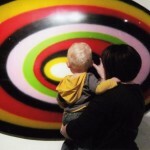 Ipswich Art Gallery has hosted the most amazing interactive exhibition for babies and tots – Bright and Shiny. 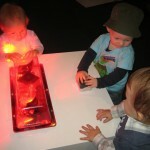 Bright and Shiny was a hands-on art-themed play space. 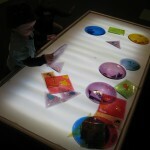 It was developed with consultation with Early Childhood professionals. 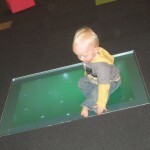 It allowed tots to explore their creative potential and the sensory world around them, as they followed their interests and set their own pace. Ben loved it!!!!!!!! (and so did his mum) We attended three sessions. 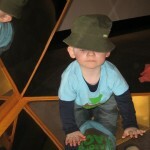 His mates Oliver, Joseph and Jayden also came to play. Each time we attended Ben used the space differently. 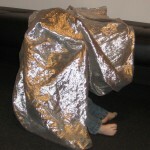 He also revisited his favorites – the sliver piece of cloth, the books, the fireman light and the tunnel. 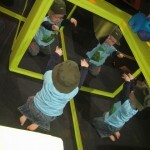 It was interesting to watch Ben grow in confidence in the space and manipulate items differently each week. 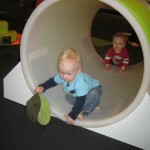 Each session had a focused activity as well as free exploration. 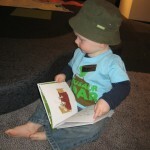 The first week we attended the story ‘I love to Sing’ by Anna Walker (one of Ben’s favorites) was featured. It was projected onto the wall. Ben immediately crawled over to the wall touching the pictures. The sessions ran for forty-five minutes but felt like five minutes. 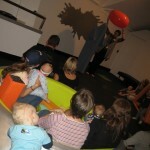 The experience was designed for children but also for parents to enjoy their children which certainly was the case. 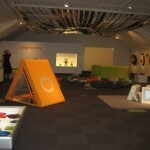 We look forward to the next tots exhibition. Scroll on the images for an explanation. The sling is off!!!!! After a couple of days of gingerly using his arm Ben is back to his old self. How about that, three weeks and back to normal. He is pulling himself up again and walking around everything. He will also walk with you holding onto only one finger!!!! He WILL walk anytime now……. fingers crossed!